Had a chat recently with some dude that liked this circuit very much. So … I took a closer look at it, and came to the conclusion that there are a few things that I would enhance / modify, and maybe it will perform just a little bit better. But first things first … Let us start off with a simplified drawing of the whole concept, just to put things in perspective. The concept of DHT heated tubes is linked to the notion that the cathode (which is the heater at the same time ==> hence “directly heated”) is subjected to the voltage swings of the signal. Since Cathode = Heater, as it is one and the same thing, it is obvious that the signal swings are directly galvanically linked with the “heater subcircuit”. The dream of each and every DHT based audiophile is to achieve a state, where the audo signal is not contaminated by the heating subsystem. Or to put it differently, that the filament heating subsystem does not give right of passage for those signal swings which exist upon that audiophile cathode, via some sort of stray currents, or parasitic and unwanted “paths”, to ground, to the AC mains … or to whatever “elsewhere”. The concept of this design is based on the fundamental idea so as to ENCAPSULATE the filament / heater within a “box” of high impedance, via which no portion of the highly audiophilia signal may escape, and hence do loss incurred, no harm is done. We need a room without doors. Or, maybe, a room with two doors, but with no door knobs. Sealed tight, closed up, and the keys thrown away. Shut off from any and all surrounding environment. Separated. A room constituting protective seclusion. Encapsulation. A nut-house prison cell. Actually, a current source has an infinite (∞) dynamic impedance. We need TWO of such infinite impedances, as any and all filament has two ends. Each a possible route of “escape” of the audiophilia music signal to the land of … elsewhere. Kill them stray currents at the source, before they escape and do some damage to the golden ear of that critical listener down south on the sofa. The Encapsulation BOX is created by means of two current sources. Regulated current sources. But to make things more interesting, it is a know phenomena, that two “independent” current sources, when connected in series, tend to go “wild” and fight with each other, each trying to superimpose “IT’s” current upon the other. Not good. So, in essence, these need to be “cooperating” current sources. Ones that do not “fight” with each other, but “complement” each other, like man and wife in a perfect marriage (ha, ha, ha !!!). This is represented by that gray double arrow, establishing a “logical” link between the two current sources, just to point out that they cooperate with each other. Ok. Having leveled the playing field and straightened out the basic notions, concepts, and perceptions, of where I am coming from, now we return back to the subject of where I am heading. Back to the revised circuit diagram…. The thing is, in the “original design”, I had specifically built in a boosted positive power supply, just for the sole purpose of providing the driver transistor of the voltage regulating mosfet some headroom, enabling it to provide a healthy amount of voltage to the mosfets gate, enabling a state of very intensive conduction (and hence: low voltage drop) upon it. A lesser voltage drop on the mosfet would translate to a lower power dissipation and a smaller radiator for this mosfet. But Hey ! Wait a minute. There are two OTHER mosfets in this original design, which I sort of “ommited” in this line of thinking. These other mosfets, working in tandem as a floating regulated current source, these mosfets could also benefit from the possibility of driving their gates with a healthy surplus voltage with ample headroom overhead. If I can reduce the voltage drop on these conducting mosfets, then they will also benefit from smaller power dissipation and smaller radiators. Now, very similarly to the “plus” side voltage booster / doubler circuit, I have now added a mirrored network from the “minus” side, providing a negative voltage booster / doubler circuit. In order to keep things well in focus, I used thick black lines to highlight the heavy current path. The “positive” booster voltage is now used as an ample overhead voltage to power the collector of the BJT driver transistor for the Mosfet acting as voltage regulator, but also, additionally, it plays a similar role in the contest of the collector of the BJT driver transistor for the top-side Mosfet of the current source hybrid. Similarly the new “negative” booster voltage, as obtained from added third, bottom rectifier bridge, now serves to provide overhead negative voltage to the collector of the BJT driver transistor for the bottom-side Mosfet of the current source hybrid. Both the “positive” and “negative” booster voltage circuits need only supply a very small current for some driver transistors. Considering their very light loads, It is fairly easy to provide a very well regulated and stable output from these circuits, with minimal ripple. So, now we have the three rectifiers. The middle one, a heavy current type of rectifier and filtering circuit, and additionally, a top-side voltage booster, and a bottom side voltage booster. 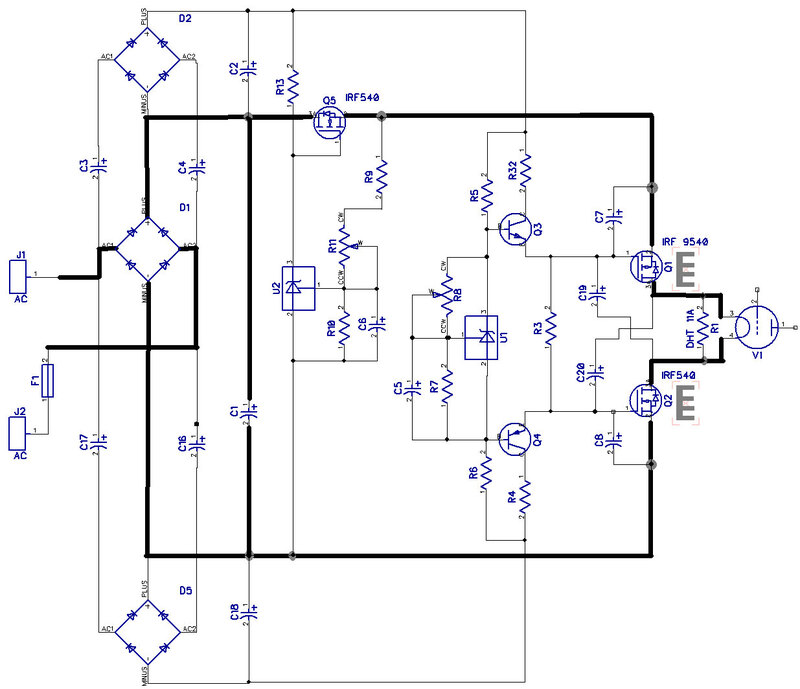 All in all, that is in total close to three times the voltage than from a single rectifier and filter circuit. 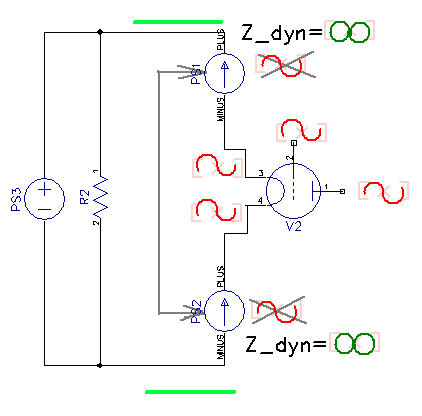 Hence, indeed, the two driver transistors of the floating current source hybrid now seem to be getting a beating in terms of substantial collector voltages. But then again, these transistors do not conduct excessive currents, so the power dissipation will not be critical. It suffice that the transistors have a voltage sufficient voltage rating, say of a value of the sum of the total top-to-bottom rail voltages (i.e. 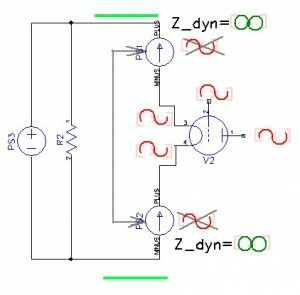 the “tripple” voltage). Two resistors fell out, in comparison to the original circuit, as their added value was questionable. Now the current source tandem is fully afloat, including the bias spread regulator circuit, the two complementary driver BJT’s, and the two mosfets. The bias multiplier circuit is used to establish a total bias voltage for the following string of recipients: The top-side BJT base-emitter voltage drop, the top-side Mosfet gate-source voltage, the voltage drop on the tube filament, the bottom-side Mosfet gate-source voltage, and the bottom side BJT base-emitter voltage drop. One would think that that is a hell of an extended voltages string, with two non-trivial mosfet gate-source voltages adding up along the way. But hey, that is all peanuts in comparison to say 12,6V on the filament of the tube itself. In other words, the current regulation and stability will be superb, because the 12,6V drop on the filament itself is a substantial part of the total sum of the bias voltage drops, hence assuring good current regulation of the contraption. Any fluctuation or change of the current flow through the filament, say, an increase of current, will result in an increase of the voltage drop on that filament. This increase will bite into the total sum of the preset bias spread, and will diminish the bias voltages upon the BJT’s and the gates of the mosfets, hence forcing them to decrease conduction. So we see that stability of current flow in ensured. At the same time, thanks to the ample headroom of the boosted “plus” and “minus” voltages, which are available from the separate supply rails, allows to keep the overall voltage dropout on all of the mosfets at reasonably low values, whilst still keeping them within the range of useful regulation. The two capacitors from gate to drain are there just in case, as antiparasitics, to cut out any tendencies towards self oscillations. The resistor in parallel to the tube filament is supposed to serve as a dummy / standby load for the circuit, in case that the tube is removed from the circuit or a loss of contact on the tube pins occurs. Now, here is a yet slightly more revamped version of the prior. The voltage regulator is pretty much static in terms of ”nothing happening there” in terms of dynamics, so I totally threw out the controlling transistor, and now provide the reference voltage directly to the gate of the mosfet. As for the current-source-hybrid, this is now enhanced with a slow-start feature. Two additional, electrolytic capacitors now span cross-wise between the gate of the respective mosfet and the “other end” of the filament. 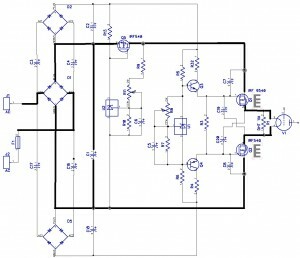 In connection with the newly added resistors within the collector cirquits of the driver transistors, they form RC circuits of sorts, with the possibility of achieving substantial time constants, by means of using some heavy collector resistors. 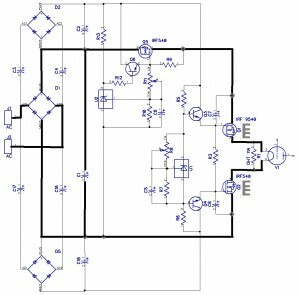 This is possible thanks to the voltage drive nature of the mosfet gates, as well as to the excessive and abundant booster voltages at each driver’s collector. 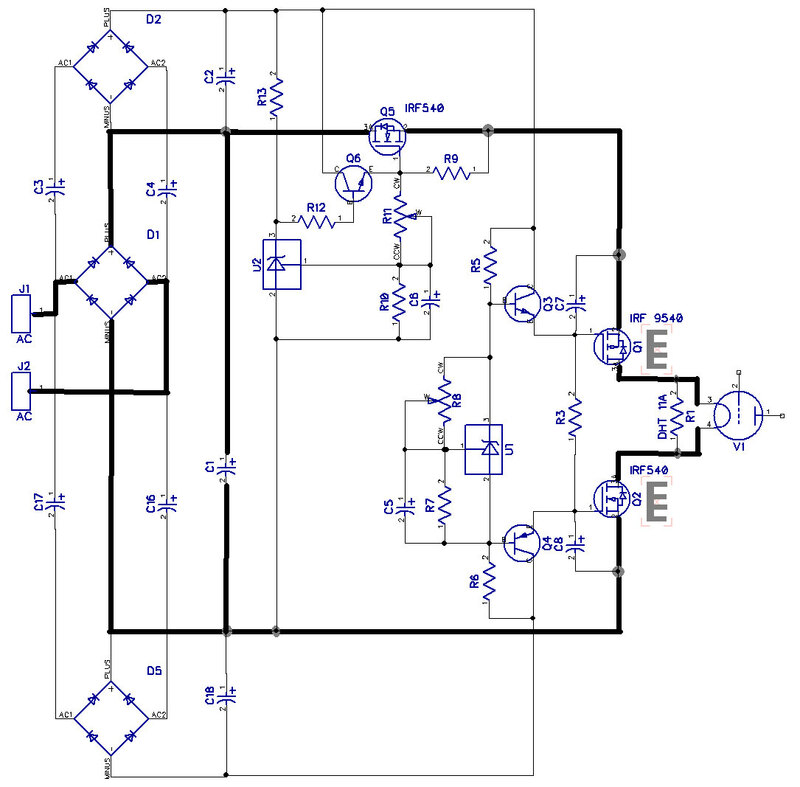 In essence, the complementary driver transistors path does not need excessive bias current. Hence, in combination with the two electrolytic capacitors, the gate voltage drive on both of the mosfets will build up only very gradually, providing for a graceful soft-start of the filament current. By putting the current limiting resistors on the collector side of the transistors, rather than on the emitter side, we are capable of maintaining a well defined voltage drop of 2x Vbe between the bases of the driver transistors, where the bias voltage generator reference resides, and the actual voltage spread between the gates of the power mosfets, hence for allowing to maintain a good current regulation, within the hybrid floating current source, irrespectively of the slow-start feature at circuit start-up. 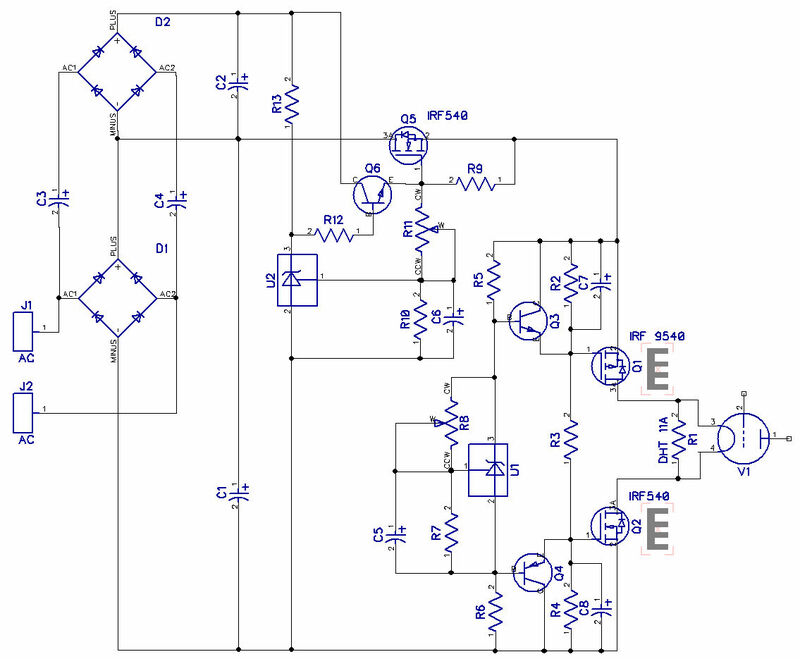 What if we were to heat DHT output tubes with a fixed DC **current**, and not with *voltage*. 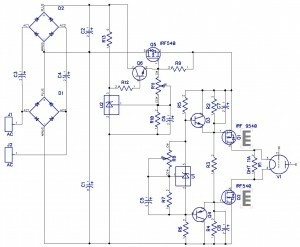 What if this whole circuit were to be totally afloat on top of the swaying music signal, with absolutely no direct connection to ground. What if both of the filament terminals see a very high impedance of the source circuit that is driving them and heating the filament. In such a case, the “music signal” would have no possibility of “escaping” from the output stage circuit, wandering around and finding some stray paths, via the DHT filament heater power supply. Not even through the winding-to-core parasitic capacitances of the filament power supply transformer. The high impedances of the drain of Q1 and Q2 would constitute a high impedance wall, impenetrable for the music signal. Imagine that we say STOP to any and all stray and wandering music signals. Kill them before they grow. Right at the filament terminal taps. Just a vague concept of mine.